A little less then two years ago my fiancé told me he was going to send me to a day spa for an anniversary gift. I was really excited:) What woman doesn't like to be pampered? Anyways I was browsing Facebook and noticed a picture posted of the most beautiful puppies I had ever laid eyes on. I talk to my fiancé and told him I wanted to go check them out. I set up a meeting. When I got there the gal that had the dogs told me how she ended up with these four female blue pit bulls. While visiting a friend in California, she noticed her friend's neighbor outside. She could hear sounds and was curious so she walked over. There stood a man holding a large rock, getting ready to kill four newborn female pups! She stopped him and asked why he would do such a thing. He told her that only the males make good fighting dogs and he had no need for females. She begged to take them from him. He allowed her to do so if she bought him 4 large bags of dog food. The friend she was visiting then told her about how the man breeds his female back to back and beat her and the other dogs regularly. She told me about how she brought the pups back to Wyoming and hand raised them. She then took me back to see them. Kiara came right up to me (ten weeks old). She climbed up in my lap and at that moment I knew I could never let her go. I paid the lady $150 to cover the vet bills for shots and testing. We couldn't afford both the dog and a trip to the spa.... 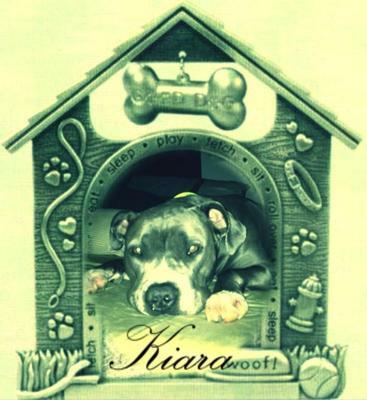 However to this day I can say Kiara is the best gift I have ever received! I hope this man was turned in. #1 He was going to kill animals. #2 He admitted to keeping the males for fighting. #3 I doubt it was his first time and I doubt it will be his last time being cruel to animals. Double no no! Time that that man to go to jail. What a very sick sick human he is. I love that the four females were rescued. You dog is adorable. God bless you for saving her.